Categories: Arts One - social event., UBC - academic event. 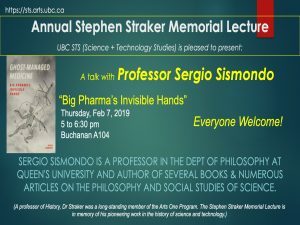 Sergio Sismondo is the author of Ghost-Managed Medicine: Big Pharma’s Invisible Hands (Mattering Press, 2018), An Introduction to Science and Technology Studies, 2nd ed. (Wiley-Blackwell, 2010), The Art of Science (with Boris Castel) (Broadview Press, 2003), and Science without Myth: On Constructions, Reality and Social Knowledge (SUNY Press, 1996). With Jeremy Greene, he edited The Pharmaceutical Studies Reader (Wiley, 2015). He is editor of Social Studies of Science, one of the leading Science and Technology Studies journals in the world. A professor of History, Dr Straker was a long-standing member of the Arts One Program. The Stephen Straker Memorial Lecture is memory of his pioneering work in the history of science and technology.